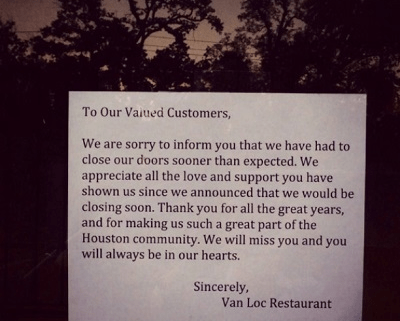 Dear Van Loc, We get it, times are changing. 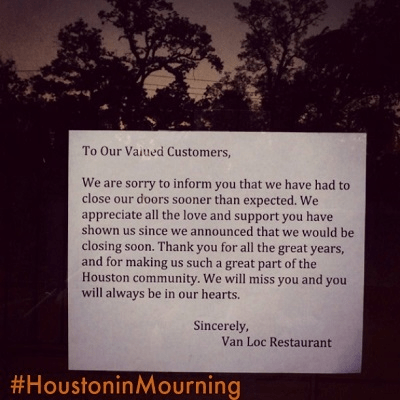 Doesn’t mean all of Houston isn’t mourning you though. I ate your pho when I was sick, ate green curry for the first time when I was on a magical fist date, would visit you for “after Pat’s radio show on Tuesday” dinner. And my lawd, the people watching!!!! I’ve seen everyone from famous peeps who were playing the Toyota Center to one of our local homeless gents, folks from all walks of life. Simply Awesome. Most recently, I ate two plates of greens with my egg rolls 2 Sundays ago, catching lunch with my love after we hooped our buns off. That was the day BEFORE you put up your “We are closing” note. And a week and a day before you closed early ’cause you ran out of food. You didn’t anticipate how much the city loved you, your cuisine, and quirky staff. We loved you. Super good luck in your next adventure Van Loc owners, and way to have something stellar on your resume to all the employees. XO, Rowan P.S. : Mayan Abdominal Massage, Arvigo Therapy sessions are going well, come on in if it calls to you.